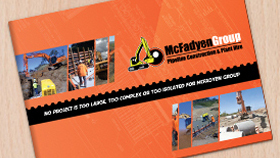 McFadyen Group - Look no further than McFadyen Group for all your earthmoving equipment hire in Brisbane. For quality equipment hire at a great price call us today. If you are looking for earthmoving equipment to hire Brisbane, then the McFadyen Groupis your solution to getting your job done. Our extensive range of premium earthmoving machinery boasts the latest plant of reputable brand names, and you can trust they will never fail you no matter what the job. All our earthmoving machinery is stored properly and is well-maintained to ensure it is kept in the best condition possible. Our equipment will help you shift, cover, dig and mould to your projects requirements. If you need earthmoving plant hire than call us today. McFadyen’s strong reputation means you can trust you will receive the best earthmoving equipment, at the best price, along with superior service from our dynamic team of experienced work force. Our earthmoving machinery helped successfully complete major projects across Australia, such as the Ballina Bypass NSW, Hunters Expressway Newcastle NSW, Gateway Upgrade Nudgee QLD, and the Airport Link between Bowen Hills, Kedron and Toombul in Brisbane QLD, to name a few. No project is too large, complex or isolated for McFadyen. Regardless of the job at hand, we have the right equipment for your needs so you can get the job done. Call or email us to find out more information and to organise your next projects equipment hire.